Above: With her siblings, parents and her maternal grandparents. 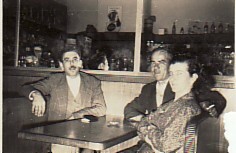 Standing are her parents, Panagiotis and Taxiarhia, while seated are her grandparents, Dimitrios and Sevasti Varouxis. In the front are Aliki and her siblings, Ignatios, Konstantinos, Katina and Aliki (with the bow in her hair). Above: Her brother, Ignatios (left), with Dimitrios and Garoufali Zontanos. 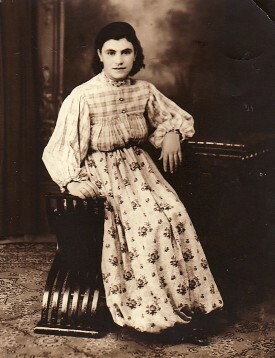 Above Right: Dressed in traditional dress. Circa 1934. Above: With her husband, Ioannis, and their daughter, Katina. Above Right: Washing in the rear of their milk bar business in Bondi, Sydney, which the family owned for several years in the 1950's. Above: With her husband, ioannis, and their children, Katina and Panagiotis.